Do you have love handles, some extra fat around your belly, or maybe a muffin top? Do you have a double chin? How about some extra fat around your inner or outer thighs? You may be a candidate for CoolSculpting®. Fat that doesn’t seem to go away no matter what we do is frustrating and unflattering. Many people try diet and exercise methods to lose excess fat but have little to no success. The thought of surgery, however, can be daunting, and people often do not like the idea of the longer recovery from surgery. The CoolSculpting® procedure eliminates stubborn fat safely and effectively, without surgery or downtime. It is a non-surgical alternative to liposuction. CoolSculpting® is the only FDA-cleared procedure to use controlled cooling to safely target and reduce fat that is resistant to diet and exercise. This safe and effective non-surgical treatment creates a slimmer, more defined physique. We offer CoolSculpting fat reduction and body shaping to patients in McLean, Tyson's Corner, Great Falls, Vienna, Arlington, Falls Church and the Northern Virginia region. We also treat the double chin area (submental fat) with Kybella if Coolsculpting is not right for you or if you need additional fine tuning after Coolsculpting. Please click on this link to go to our Kybella page. Ideal candidates are within 30 pounds of their ideal body weight but have areas of excess fat. It should be noted that CoolSculpting® is not for everyone and is not intended for people who are significantly overweight nor those who have very large amounts of fat. CoolSculpting® should also not be used as a weight-reduction program. CoolSculpting® only affects the targeted fat cells, leaving the surrounding tissue unharmed and intact. It is a comfortable procedure during which patients sit or lie down and can read or work on a laptop, tablet, or phone. Many people nap during the procedure. The treatment does not require any anesthesia or sedation, and patients can resume normal activities immediately after the procedure. The targeted fat cells are absorbed and eliminated from the body. However, weight gain can cause the remaining fat cells to increase in size, affecting the original results. Many patients are extremely happy with how their body looks after CoolSculpting®, which motivates them to stay close to or at their ideal weight. Healthy individuals who eat well and exercise regularly to maintain their results benefit the most from CoolSculpting®. *Results are not guaranteed. Results and patient experience may vary. We use the brand new, state-of-the-art CoolAdvantage™ applicators that cut the treatment time in half with improved results! We have all of the available applicators, which allows us to perform CoolSculpting® on all of the treatable body areas. The CoolAdvantage™ handpiece is the workhorse of the CoolSculpting® platform and is ideal for upper abs, lower abs, flanks (love handles), inner thighs, and bra fat. Studies suggest that up to 20 to 25 percent of the treated fat can be reduced with each treatment. The CoolMini™ handpiece offers a non-surgical, FDA-cleared treatment for people with a double chin (referred to in the medical field as submental fat). The results can be truly amazing as you can see from the before and after pictures. The CoolMini™ handpiece is the smallest applicator. It freezes and destroys the fat below the surface of the skin. Studies suggest that on average up to 20 percent of fat is reduced, and most results are noticeable in one treatment with more dramatic results seen after two treatment sessions. Results are not guaranteed, and your results may vary but as demonstrated in the before and after photos, it is possible to get very dramatic results. The treatment time is 35 minutes. This handpiece can also be used for fat above the knee caps on the lower thigh. The CoolAdvantage Petite™ handpiece is a non-invasive fat removal technique used mainly on the upper arms (sometimes called fat arms or FARMS), knees, and backs of the thighs. The applicator is FDA cleared and the only one of its kind cleared to treat the upper arms. This treatment is quick, usually lasting about 35 minutes. This CoolSmooth Pro™ handpiece is for non-pinchable fat deposits such as the outer thighs (saddle bags). The treatment time is 75 minutes. This CoolAdvantage Plus™ handpiece is for larger pockets of fat such as belly fat that hangs over the waistband of pants. It is ideal for the lower abdomen and occasionally the upper abdomen and flanks (love handles). It is the largest applicator. The treatment time is 45 minutes. How much does CoolSculpting® cost ? 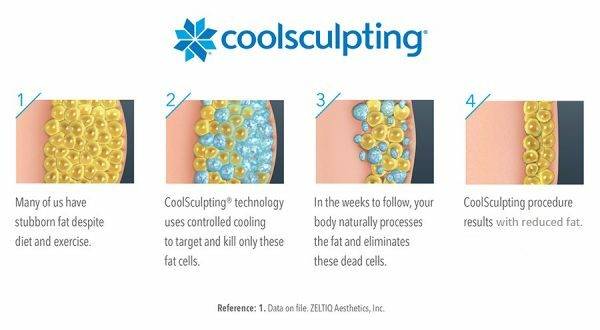 The price for CoolSculpting® varies based on the amount of work needed, the areas focused on, and the number of sessions it takes to complete your desired look. After a customized consultation with Dr. Rothstein, you will be able to gain a better understanding of how much your personalized procedure will cost. In general, it is comparable to, or less than, liposuction. What does the procedure feel like ? Is it safe ? During your procedure, you will feel a little bit of pressure and a fairly strong sensation of cold in the treatment area at the start of the procedure. These sensations pass quickly, and most patients do other things to pass the time during the treatment session. The CoolSculpting® techniques are FDA cleared, performed all over the world, and have proved to be a safe and effective means for non-invasive fat reduction. Where does the fat go ? When will I see my results, and are they permanent ? Your body automatically processes the fat and naturally disposes of the dead cells once they are crystallized. You may start seeing minimal results as early as three weeks after your session, and you will see more dramatic results after about two months from your initial treatment date. It can take up to six months for your fat cells to completely flush out of your system and for you to see your final results. Once the fat cells are out of your body, they are gone forever; however, if you do gain weight in the future, the remaining fat cells in the treatment area can swell with fat and lessen your initial results. As always, new weight gain can cause fat cells elsewhere in your body to swell as well. Therefore, it is a good idea to maintain your weight after CoolSculpting® and as always, healthy eating habits and exercise are highly recommended. We feel strongly about educating our patients on healthy eating, healthy lifestyle choices, and exercise. What are the side effects of the CoolSculpting® treatments ? Side effects after your procedure may include temporary swelling, bruising, redness, and numbness. Your treatment area might also feel firm or have a tingling or stinging pain. Side effects almost always resolve completely; although, as with any medical procedure, a few patients have some long-term side effects. These long-term side effects, if they do occur, are typically not serious or debilitating for CoolSculpting® patients. Do I need to follow any strict diet or exercise routine after the procedure, or may I return to my normal activities ? No, you do not have to go on a diet or do any particular exercises. Yes, since this procedure is non-surgical, you are able to resume all activities immediately after your treatment. If you want to learn what’s so “cool” about CoolSculpting®, Dr. Rothstein can provide you with additional information during your complimentary consultation. Contact us by calling our offices conveniently located in McLean / Tyson's Corner, Virginia, Washington, DC or Bethesda / Chevy Chase, Maryland office at (703) 552-3171 or by filling out our online contact form. © 2019 Washington Vein Specialists | All Rights Reserved. Now part of Virginia Vein Care.